LONDON — What will the store of the future look like? Will we be served by fleets of gleaming robots, using built-in facial recognition technology to adjust each sales pitch to a person’s current mood or past spending preferences? Will there be voice-activated personal assistants, downloading the availability, color and fit of any and every garment to your smartphone? Three-D printing stations? No checkout counters when you leave? Could there even be floating, holographic product displays on the shop floor that change when a customer walks by? Perhaps shoppers will make all their purchases from their own home, using virtual fitting rooms via virtual reality headsets. Drones will then drop deliveries in the backyard or on the front steps. As fanciful as these innovations may sound, none are hypothetical. All exist, are being tested and could be rolled out in as little as a decade. But is this the sort of shopping experience that customers really want? Scores of leading retailers and fashion brands increasingly say no. And in an ever-more-volatile and unpredictable shopping environment, where long-term survival is dictated by anticipating and catering to consumers’ desires (often before they themselves even know what they want), the race to find out how and where people will do their spending has started to heat up. On Wednesday, for example, Farfetch — the global online marketplace for independent luxury boutiques — held a daylong event at the Design Museum in London. 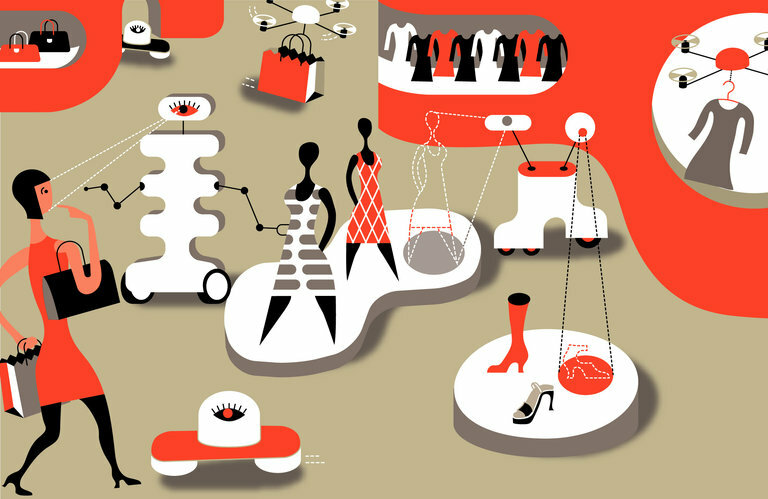 There, in front of 200 fashion industry insiders and partners, José Neves, the founder of Farfetch, unveiled “The Store of the Future,” a suite of new technologies developed by his company to help brands and boutiques bridge the worlds of online and offline. A corresponding report released by Bain & Company this week suggests that he might be right; although 70 percent of high-end purchases are influenced by online interactions, the consultancy maintains that stores will continue to play a critical role, with 75 percent of sales still occurring in a physical location by 2025. What may change, however, is a store’s primary purpose. Forget e-commerce, or bricks and mortar, or even omnichannel sales; according to Mr. Neves, the new retail era is one anchored in “augmented retail,” a blend of the digital and physical allowing a shopper to shift seamlessly between the two realms. Holition is an augmented-reality consultancy and software provider based in London that has worked with some well-known retail brands. Last fall it worked with the British cosmetics company Charlotte Tilbury on a “magic mirror” concept, a virtual makeup selling tool that allows users to try on different looks that are digitally superimposed onto their faces in 40 seconds. They can then send the selection of photos to their email address, ready to be referred to later or shared socially. And they then can buy products, available from glamorous makeup artists milling around nearby. “Technology is still often a barrier in the retail place, with smartphones, iPads and screens getting in the way of what the consumer wants to see, touch and feel 80 percent of the time,” said Jonathan Chippindale, Holition’s chief executive. Tom Chapman, a founder of MatchesFashion.com, agreed. It was originally a bricks and mortar boutique; now 95 percent of the British fashion retailer’s sales — which hit 204 million pounds (about $253 million) in 2016 — are online. But Mr. Chapman said boutiques and physical events remained vital “marketing opportunities,” with a more specialized inventory selection and the opportunity for customers to do more than buy merchandise; for example, the MatchesFashion.com “In Residence” series offers talks, film screenings and designer meet-and-greets, along with social media lessons, exercise classes and floristry sessions. Rachel Shechtman, the founder of Story, a store in Manhattan, has taken that concept further than most. The store, opened in 2011, was created to present its point of view like a magazine, one that gets a complete makeover with a new design, range of products and marketing message every four to eight weeks. Story has multiple revenue streams. One is with sponsors, who can use the store to create “living advertorials” with singular themes, and where companies can then promote items to consumers as they shop; brands, corporations and retailers pay $500,000 and up for a “feature” slot. Features have included “His Story,” sponsored by Braun, Old Spice and Gillette, with a hot towel shave station offering free shaves daily, and a “Making Things” story, sponsored by General Electric, with MakerBot 3-D printers and injection molding machines. “If time is the ultimate luxury and people want a higher return on investment of their time, you need to give them a reason to be in a physical space,” said Ms. Shechtman, who has worked with more than 4,000 brands and who consults for a range of big-box retailers. The United States department store Lord & Taylor is doubling down on that approach, with the unveiling of its 30,000-square-foot Dress Address last month, the largest dress floor in the country. Along with featuring designers like Oscar de la Renta, Cushnie et Ochs, Naeem Khan and Marchesa, there will be a special section called “The Gallery” with a full-service concierge, as well as a pop-up store concept. The first pop-up will be Cameron Silver’s Decades; brands will change every eight weeks. While technology may play a role, it is largely behind the scenes, adding delivery speed and a broader choice to customers if they want it. Still, there is no question that a certain demographic of consumers — particularly those under 35 — are demanding the ability to have any product they want, whenever they want it. Last week, Yoox Net-a-Porter, in partnership with Valentino, started “Next Era” — access to the biggest Valentino store in the world, but one that won’t be on any street, plaza or avenue. Scheduled to open early next year, the initiative will give customers online access to any product they want from any Valentino store or logistics center globally, as well as those of Yoox Net-a- Porter, with rapid delivery, a smartphone-centric interface and artificial-intelligence-powered services such as on-site personalization. And this week, the rival Farfetch unveiled F90, a delivery service for Gucci in which Farfetch will facilitate the delivery and return of products directly from the Gucci store to a customer in 90 minutes across 10 cities. “Timely delivery of product remains the top of all criteria for luxury consumers,” Mr. Neves of Farfetch said. “They want storytelling and theater of course, but they also want their chosen item, in the right color, size and in their hands as quickly as possible.